This month is blessed with two very good dark sky observing weekends, and we opted to take the first one at a spot we’ve been thinking about for a couple of years now. 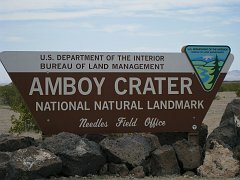 Amboy Crater National Natural Landmark is a volcano crater in California south of I-40, near the town of Amboy, CA. We first visited the site in the spring of 2010. The hike to the crater was fabulous, and the wildflowers were stunning. Our regular site at Chuckwalla Bench is also a Bureau of Land Management (BLM) site, but unlike Chuckwalla Bench, Amboy Crater features a paved road, pit toilets, parking spots, and picnic tables. Here’s a Google Maps link to the landmark and its facilities. The downside is that the drive is about 25 miles longer than the trip to Chuckwalla Bench. It makes for about three-and-a-half hours driving each way. Astronomically, Amboy Crater is one of the darkest locations in the state, with frequently clear skies and sometimes overly hot conditions. 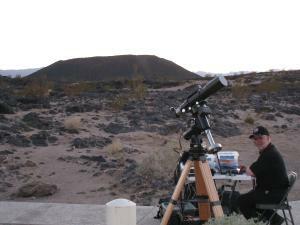 Mojo set up for astrophotography with Amboy Crater in the background. This past Saturday evening had a nearly perfect forecast. We arrived on a hot dry afternoon, and enjoyed shirt-sleeve or light jacket conditions all evening with a crystal clear sky. We were joined by one other astrophotographer (Robin), and two seasoned visual observers (Cliff and Steve). My astrophotography is extremely casual. Living in the midst of Los Angeles county, I have no desire, nor is there much reason to, have a permanent observatory of any kind. We’ve both become adept at hauling our portable observatory to locations that offer good dark skies. Actually we have quite an advantage over astronomers in the eastern half of the U.S. The California deserts offer excellent astronomy, and are within a few hours drive of home. My telescope is an Astro-Physics Traveler, 105mm aperture (about 4 inches) with a short f/6 focal length. The mount is an Astro-Physics Mach-One GTO “go to” mount, and my camera is an SBIG ST-4000XCM, the perfect camera for my style of casual astrophotography. It’s a “one-shot color” camera, meaning I can shoot and process color images in a relatively short time, with extra processing to extract the data from the Bayer matrix. 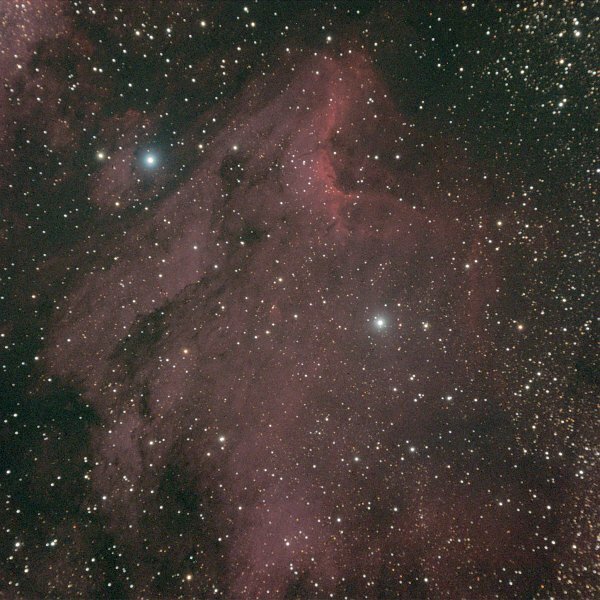 It wouldn’t be the best sensor for doing astrometrics or narrow-band imaging with specialty filters, but it’s great for playing around and taking pretty pictures (or trying to!). I had shot M31, the Great Galaxy in Andromeda, before, probably with my Canon 20D DSLR, but I wanted to take advantage of my wide field and gather an hour or so of data and see what I could get. I enjoyed watching twilight fade and set up with a very good polar alignment. By now I’ve managed to learn the quirks of Software Bisque’s CCDSoft, and was able to calibrate the autoguiding with great success. After returning home, I discovered that my first 15-minute exposure was not useable! The brighter stars in the image were fogged, probably by condensation on the CCD sensor glass. I have this mental image of bringing a telescope full of relatively moist L.A. basin air out to the desert, cooling the chip down to -5° C, and having every drop of moisture in that air condense on the chip. After the first exposure, the combination of the imager fan and the dessicant plug mounted next to the chip managed to pull out all that moisture and leave me with a dry and clear chip. The dry desert air kept me clear for the rest of the evening. 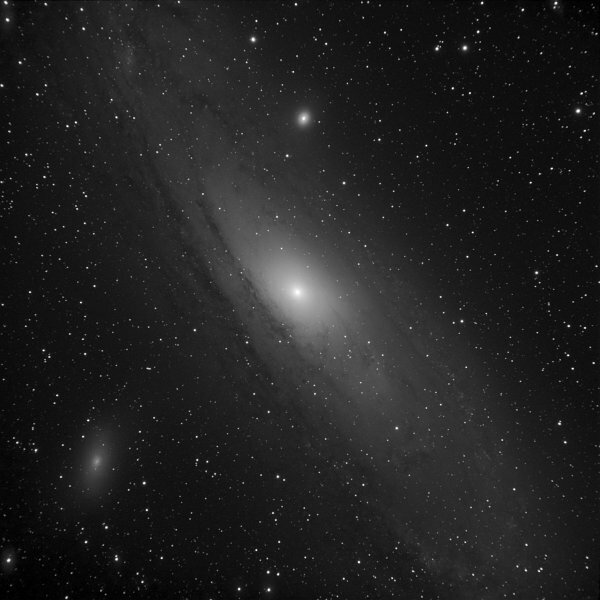 Now after going to all the trouble of having a one-shot color camera, why am I presenting a monochrome rendition of M31? I have a processing problem with the color version that I haven’t resolved yet. This galaxy has an enormous dynamic range, and this monochrome image is compressed down from a 16-bit master luminance image. I’m only able to process the color information with 8-bit dynamic range. And my processing skill isn’t yet strong enough to preserve the color data when compressing it down to computer range. Here is the color version of this image. Note that the galaxy core is completely clipped to white in the color data, and I’m left with an ugly yellow ring around the core. It’s an interesting problem, and I’m sure that I can find a way to do some “high dynamic range” (HDR) techniques to recover that color data near the core. At that point, Jane called me over to see an interesting emission nebula she was observing visually in her 17.5-inch dob. The nebulosity was just detectable visually, and I really wanted an image to compare. Fun object, full of Milky Way stars, the nebula, and even some dark nebulosity in the upper right. 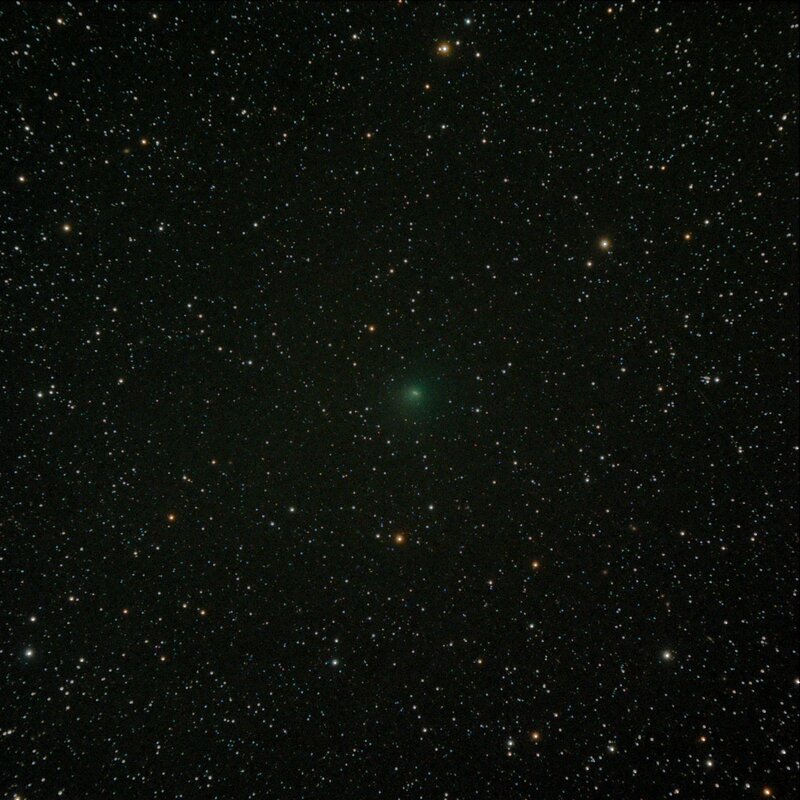 Jane hunted down comet C/2010 G2 (Hill), a magnitude 10 interloper. It was a very difficult visual observation, but she nailed it, and I saw it as well. 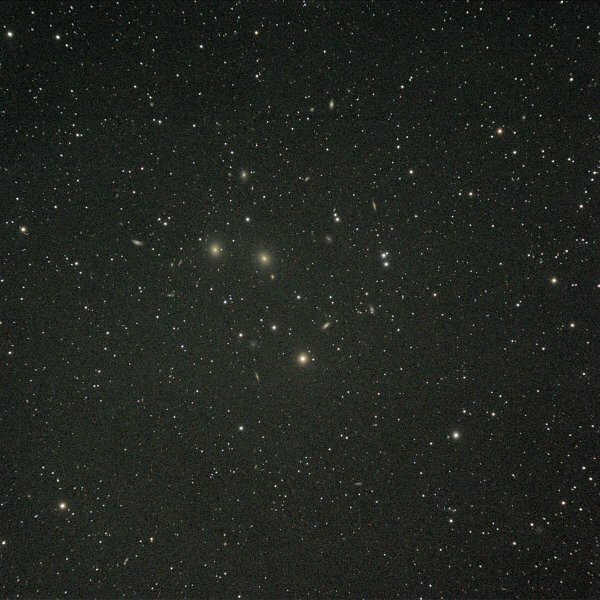 Meanwhile Jane was also tracking down interesting galaxy groups, and had fun searching the fairly distant Pegasus 1 galaxy cluster in her 17.5-inch. I couldn’t resist imaging this as well. My own misfires only left me with one usable 15-minute exposure of this fascinating galaxy group. Even with just one 15-minute exposure and lots of noise, it’s fun to see how many galaxies you can find in the full-resolution image. The two brightest members are magnitude 12. 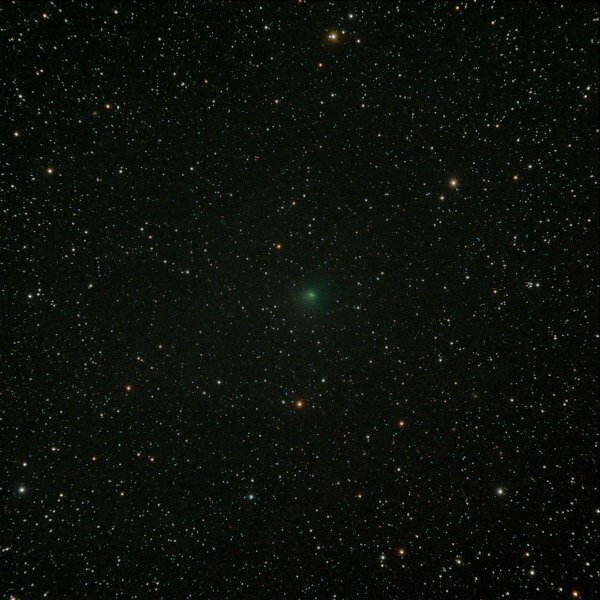 Here we go from a relatively nearby solar system object, comet Hill, to a 200-million light-year distant galaxy cluster! 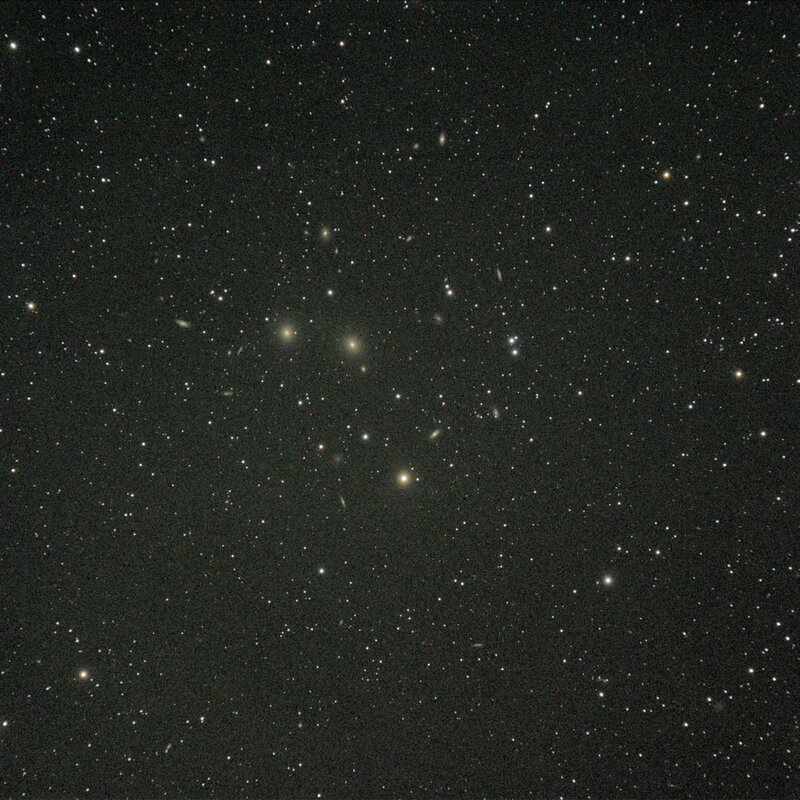 The Pegasus 1 galaxy cluster, one 15-minute exposure. Click for the full-resolution version, and see how many galaxies you can find in the somewhat noisy image. 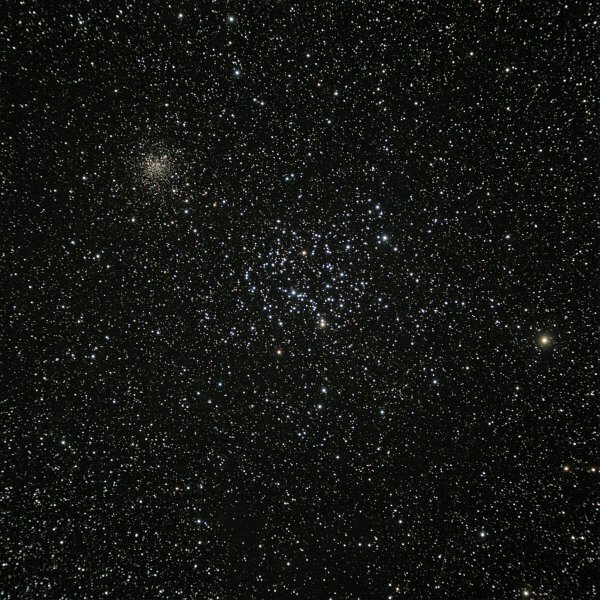 One of my favorite visual targets is the enormous nearby open cluster M35 in Gemini in the winter Milky Way. 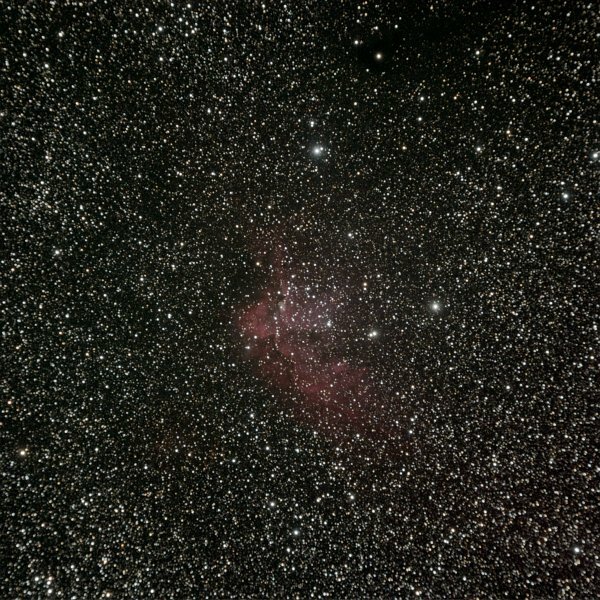 Part of its appeal as a visual target is seeing the ten-times more distant open cluster NGC2158 which is about the same actual size as M35. The image didn’t disappoint. 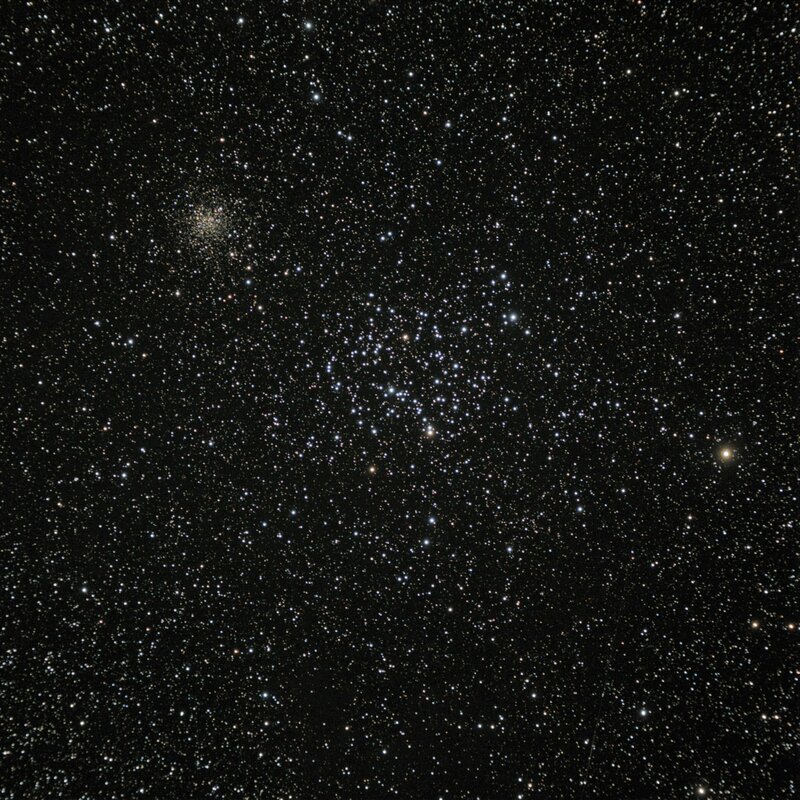 Open cluster M35 in Gemini with distant sister cluster NGC2158. 2x15-minute exposures. Just fantastic! Wish I went. 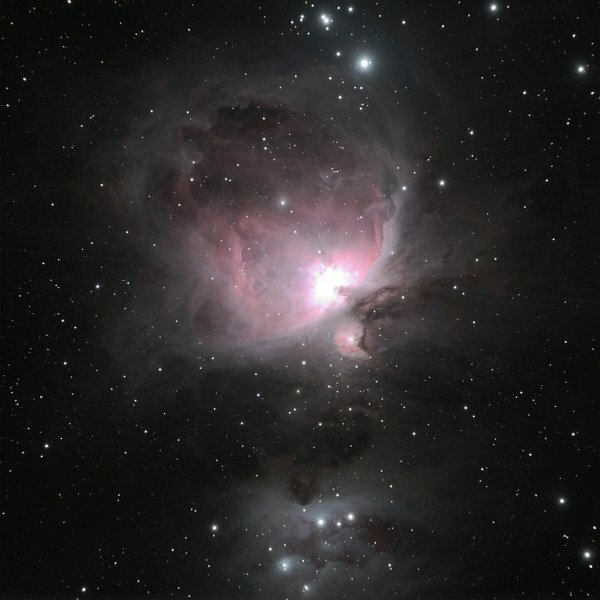 OMG yes, in the Orion Nebula picture especially. I think there are six crossing through the trapezium. All those equatorial satellites. Thanks especially for imaging M35. Nice report! Awesome photos! You’re a pro. This is a great article! I am heading to Amboy Crater today with members of the High Desert Astronomical Society! I’m gonna have to tag along with you on one of these astro-adventures to see how you do your imaging. You’ve got some incredible pics. Looks like the Trapezium lived up to its name and trapped in all those satellites. Awesome pics! We are trying to find good dark sky spot to come down to form SF area around March 20-25. What kind of conditions do you think we can expect out there? Does it get crowded at all with observers on weekday nights? Great info, thanks!